Eight simple ingredients in my southern buttermilk biscuits! These buttermilk biscuits have a gazillion flakey, buttery layers! Once you make them at home, you’ll never buy biscuits in a can again! Southern Buttermilk Biscuits. Cold grated butter, a few cups of flour, and a whole lot of love! 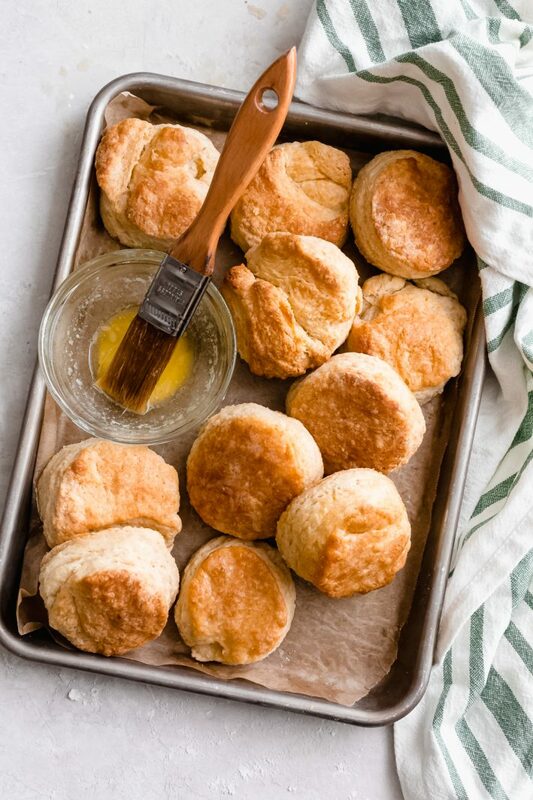 Southern buttermilk biscuits are known for their golden brown exterior with a gazillion layers of fluffy, buttery dough tucked underneath. These buttermilk biscuits are so easy to make and take about 15 minutes of hands-on time. To be completely transparent, my recipe for homemade biscuits is probably very similar to the ones you’ve used in the past. But, there’s one ingredient that I like to use when making baked goods that really elevates the flavors and makes them so much better. Also, the most significant difference in my buttermilk biscuits recipe is the method we use. I’ll give you a few essential tips to ensure your homemade biscuits are a hit with everyone you share them with. And is there anyone in this world that doesn’t love a good biscuit? Biscuits! Rolls! And just bread, in general, are my kryptonite. 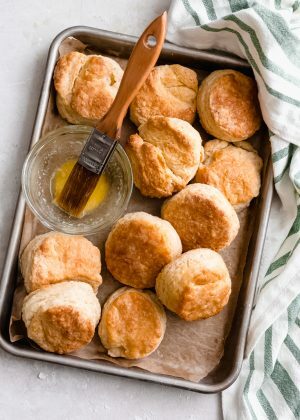 In the years past, I’ve shared my garlic and herb butter rolls , cheddar bay biscuits , and my flakey 1-hour potato rolls  with you guys and this year for Easter I thought, why not introduce you to my southern buttermilk biscuits? Of all the dinner rolls I’ve made, I think these southern-style buttermilk biscuits are my favorite. And you know those freezer breakfast sandwiches  I shared the other day? How much more delicious would they be tucked inside a homemade biscuit? Depending on where you are in the world, the word ‘biscuit’ means something completely different to you. ‘Biscuits’ in the United States and most of North America, is a term used to describe a flakey, buttery dinner roll (one that’s made without yeast.) Biscuits are very similar to scones as they rely on baking powder or baking soda as a leavening agent. WHAT DO YOU NEED TO MAKE BUTTERMILK BISCUITS? WHY DO YOU USE POWDERED MILK IN YOUR HOMEMADE BUTTERMILK BISCUITS RECIPE? Powdered milk is an ingredient I often use when making most types of baked goods. In this case, it enhances the biscuit dough and gives it a bakery-like flavor. It also increases the browning ability of the crust. Since it’s a fine powder, it quickly disperses throughout the dough and results in a more tender biscuit. The sugars in milk powder also help give the biscuits a more vibrant color. I can’t take the credit for the addition of powdered milk though! It’s a trick I picked up from my mom; she almost always uses it in her rolls or biscuit recipes! Powdered milk is usually found next to the sweetened condensed milk and the evaporated milk in the baking aisle of almost all grocery stores. 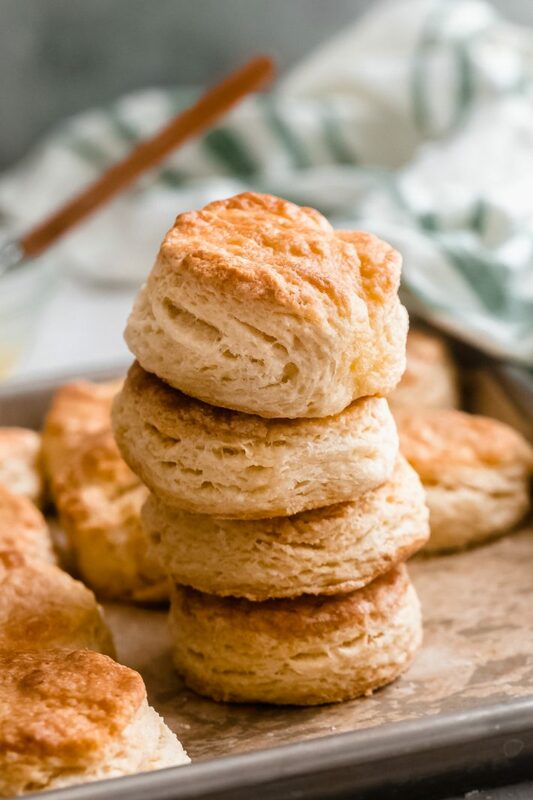 I find the best method of measuring out flour for buttermilk biscuits is the ‘spoon and sweep method.’ Use a smaller measuring scoop or cup to spoon flour into a 1-cup measure. Then use a knife and sweep from one side of the measuring cup to the other to level it off. Do this four times to make a total of 4 cups. I’ve been making homemade biscuits for years, and along the way, I’ve picked up a few tricks that I want to pass on to you. 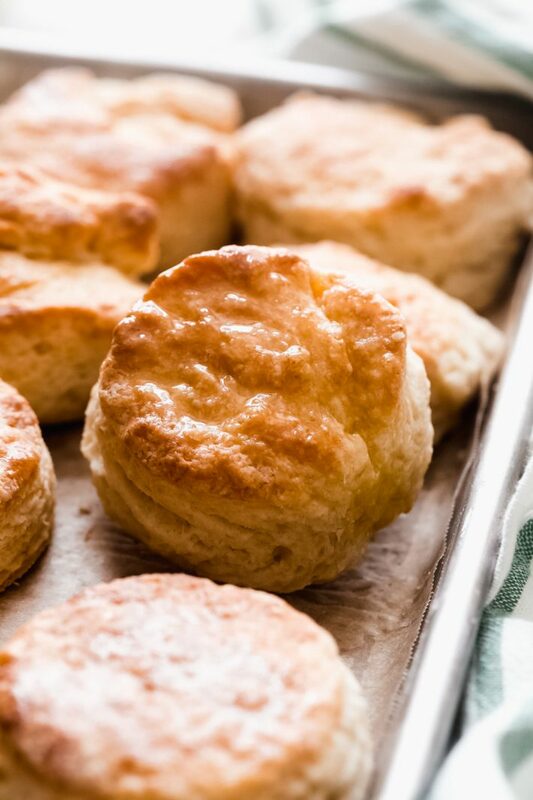 Trust me; if you follow these few tips, you’re sure to end up with a better buttermilk biscuit. Keep it cool. Keep the butter as cold as possible. If you store your butter in the refrigerator, pop it into the freezer the night before or the morning of for a few hours. I usually buy and store butter in the freezer until ready to use! The cold butter creates pockets in the dough that melt in the oven while the biscuits bake, creating a more flakey biscuit. Grate it good. Grate the butter while it’s frozen. You can do this by hand on a box grater or in a food processor. I live in Texas and grating butter by hand is as good as melting it in the microwave. What I’m trying to say, is that it’s not an option. Also, it takes forever. I highly recommend the food processor. Feel free to store the grated butter in the freezer if you plan on making biscuits later in the day. Work it, but not too much. Combine your dry ingredients, then add in the grated butter using a fork so that all the butter is evenly coated in the flour mixture. Slowly pour in the buttermilk and combine to mix with the fork. When the dough is still shaggy and crumbly, dump it out onto a clean, floured surface. A crumbly mixture is ideal here. Envelope style. We’re going to envelope fold that dough like we’re making croissants, even if we’ve never made croissants before. Roll the dough out into a large rectangle. Then grab one side and fold it towards the center, to the same thing with the other side, but fold it over the first fold you made (see the picture above.) Then, flatten the dough again and fold the side you didn’t fold last time towards the middle, again envelope style. Turn the dough 90 degrees and repeat this one more time. Give it to me straight. Using a large dough cutter, go straight down when you’re cutting the biscuit dough. Do not twist the cutter. Twisting is the worst thing you can do for biscuits as it seals the edges and doesn’t allow them to rise properly. Stay in touch. Bake the biscuit touching. For this recipe, I suggest using a 9×13 sheet pan (a quarter sheet pan) or a 9×13 baking dish so that the biscuits all touch when they bake. This allows for the biscuits to rise taller and maintain a better shape. Can we take a second to appreciate all the flakiness of these buttermilk biscuits? ↑ The trick to making perfect buttermilk biscuits is that ‘croissant dough process’ that we use that makes these biscuits so gosh darn picture perfect. Also, I love good rustic biscuits. All those crackly bits at the top give these buttermilk biscuits so. much. texture. If you’re serving these for breakfast, I highly recommend brushing them with a combination of honey and butter. One tablespoon of honey along with two tablespoons of butter is my winning ratio. However, more honey won’t hurt if you like things a little sweeter. I prefer biscuits brushed simply with a little butter while they’re fresh out of the oven. That way, you can make breakfast sandwiches, smear on some strawberry jam, or serve them up with gravy! Once you serve these homemade buttermilk biscuits, the fam is so not letting you get away with that stuff that comes in a tube anymore! 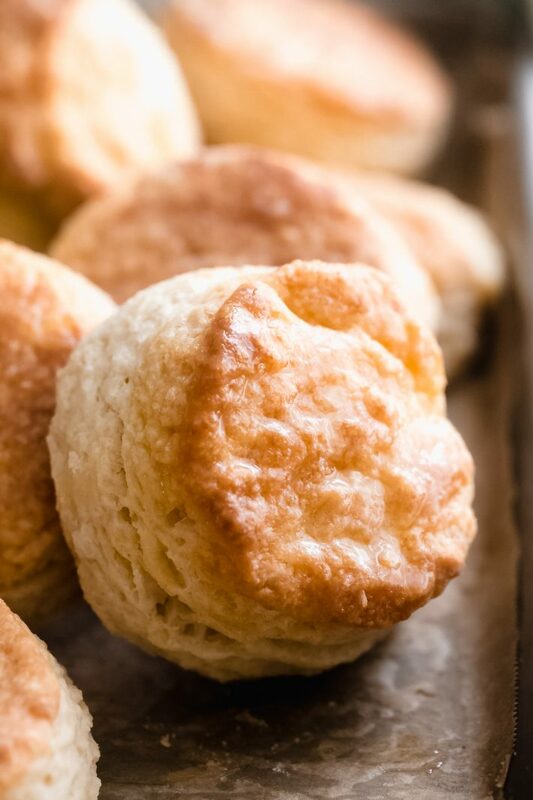 Seriously, these southern-style biscuits are the bomb-diggity! MIX: Combine the flour, powdered, milk, baking powder, granulated sugar, salt, and baking soda in a bowl. Fold in the grated butter and then using a fork, mix as you pour in the buttermilk. Add half and check and see if the mixture needs more. The dough should be shaggy but not wet, if the dough is really dry, add another tablespoon of buttermilk (up to 2 tablespoons) until the dough is shaggy. DOUGH: Dump the dough out onto a lightly floured surface. Gather the dough into a ball. Roll the dough out into a ½ inch thick rectangle (roughly 9×12.) Then fold in thirds (basically grab each side and fold it towards the middle overlapping the second side over the first.) Like you would a letter to put in an envelope. Then, flip the dough 90 degrees, so one of the sides you didn’t fold is in front of you. Roll it out again (½ inch thick.) Then, flip the dough 90 degrees, and repeat this step one more time. 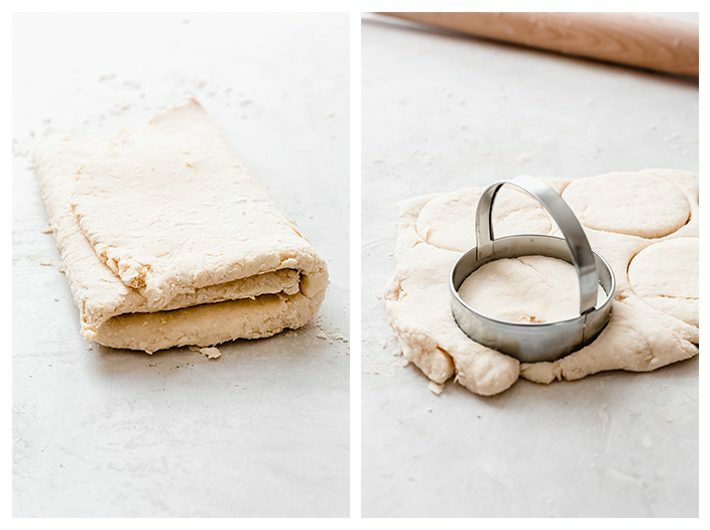 Roll the dough out into a 1-inch thick rectangle the last time and then cut out biscuits using a 2 ½ – 3-inch cookie cutter going straight down. DO NOT TWIST THE BISCUIT CUTTER. Gently reshape the dough (using that same envelope method, just once and rolling out the dough so it’s 1-inch thick) then cut out additional biscuits. 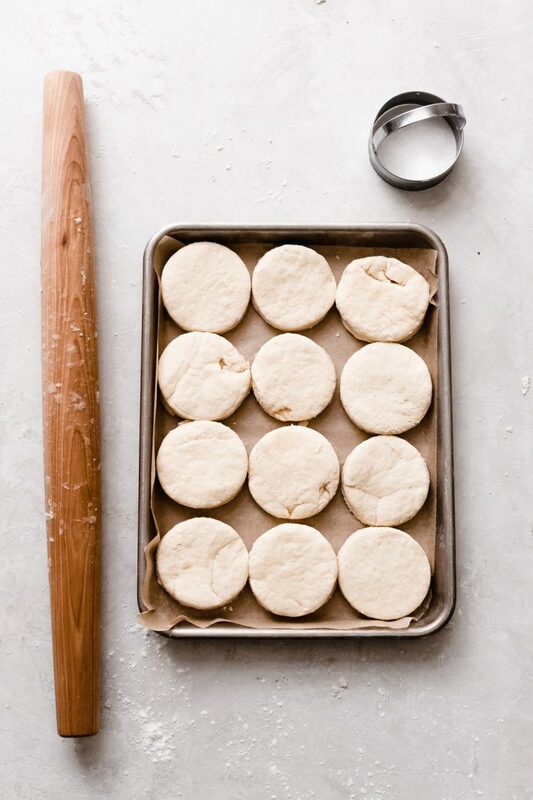 BAKE: Transfer the biscuits to a large baking sheet lined with parchment paper (placing them so they’re touching.) And freeze the biscuit dough for 8-10 minutes. Position a rack in the center of the oven and preheat the oven to 375ºF while the biscuit dough is cooling. 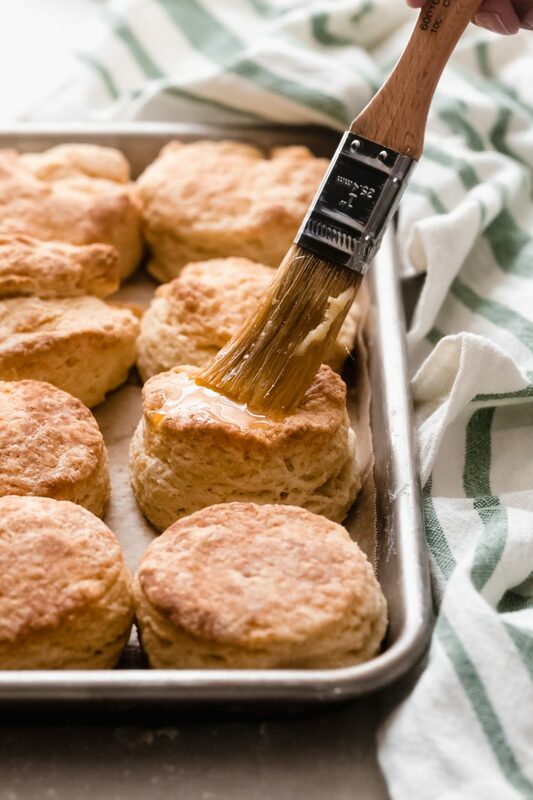 Brush the tops of the biscuits with a tablespoon of melted butter. When the oven is hot, bake the biscuits for 30-35 minutes or until the tops are golden brown and the biscuits rise nice and tall. Brush with the remaining two tablespoons of butter before serving. Serve warm! I find the best method of measuring out flour for buttermilk biscuits is the ‘spoon and sweep method.’ Use a smaller measuring scoop or 1/4 cup measure to spoon flour into a 1-cup measure. Then use a knife and sweep from one side of the measuring cup to the other to level it off. Do this four times to make a total of 4 cups. I suggest grating the butter on a box grater or in a food processor. Pop the grated butter into a bowl (or in your food processor bowl is fine too) and then freeze it for 5-10 minutes before adding it to the dough. This way, the biscuits develop those beautiful butter pockets that make these biscuits extra yummy! For a sweeter biscuit, combine 1 tablespoon of honey with the butter or brush with melted butter and sprinkle with a tablespoon of granulated sugar!